Would you like to show your students how to “see sound” and “hear” light, use a toy car as both a speaker and a microphone, mix colors in their heads, or hear voices through their teeth? 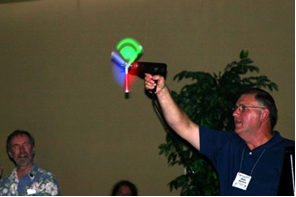 Optical and acoustical phenomena are immediate, captivating, and should be fun and exciting for your students! This presentation examines examples of low-cost apparatus that may be used to introduce students to basic acoustical and optical principles and their applications. Pulsating lights are common in our world, but often go unnoticed. We are generally not aware that common light sources such as neon and fluorescent lamps flash on and off. You can observe this flashing by attaching an inexpensive neon night light to the end of an extension cord. In a dark room, carefully swing the “neon lasso” in a circle. You may be amazed to find that a circular pattern of dots appear before your eyes (see photo below). Although the neon source is only in one place at one time, our visual system retains an image of the light for a fraction of a second. The AC voltage powering the light is rapidly switching from plus to minus and in the process passes through zero voltage twice each cycle. The zero voltage coupled with cool nature of neon light causes the light to extinguish rapidly. Since the frequency of AC current in America is 60 Hz, the flash rate of the neon light is 120 Hz. In Europe the flash rate is 100 Hz. A wand is waved in thin air and an image miraculously appears. Is this magic? 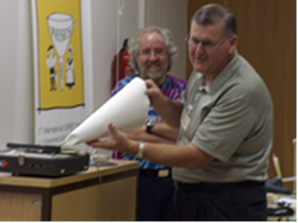 This simple demonstration uses a slide projector, a slide and a white rod to serve as the magic wand. When the slide is projected out into space with no screen, no image is visible. However, when the "magic wand" is waved through the beam of light, the image can be clearly seen. What is happening? At any instant, the light hitting the wand creates a partial image of the slide. As the wand moves, other partial images are formed on the rod. 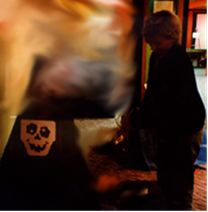 The eye-brain retains these partial images and puts them together as a single complete image, in this case the skull seen in the picture below. Using persistence of vision, it is possible to combine colors by presenting them to the eye in rapid succession. If for example, a flash of red light impinges on the retina, the sensitive cones that are activated by the light continue sending signals to the brain for a fraction of a second. If a source of green light strikes the retina within this time, the brain will perceive yellow, the additive combination of red and green. For this reason, red, blue and green chemical light sticks may be used to produce white light by spinning them on an electric drill. A bolt is used to attach the sticks to the drill. A "sandwich" consisting of alternating nuts and light sticks is then assembled. That is, a nut is placed on the bolt, followed by a light stick, followed by a nut, etc. The light sticks should be separated by roughly 120 degrees. This assembly is held snugly together by tightening down on each nut. As the red, blue and green light sticks spin, the eye-brain system combines the three colors and white is perceived. If a band of opaque tape, such as electrical tape, is attached to one of the sticks, the complement of the obscured color will be seen. The color mixing turbine3 provides a simple yet elegant way of demonstrating the use of persistence of vision to achieve additive color mixing. The following steps will guide you through the construction and use of the turbine. 1) Bend two corners of a black 5 cm x 5 cm cardboard square as shown in the figures below. Note: the dimensions of the square are not critical. 2) Attach a green sticker to one side of the card and a red sticker to the other. 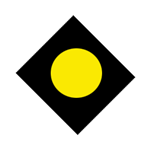 Make certain that the two stickers have overlapping areas. produces the sensation of yellow. Form a cone out of a piece of poster board or file folder. Tape the edge so that the cone will retain its shape. After you place a straight pin through the tip of the cone you will have an Edison-style record player. Cradle the cone in both hands as you lower the straight pin into the groove of a spinning record. The pin should drag behind the base of the cone, with only the weight of the cone holding it down. Grooves on the surface of the phonograph record cause the needle to vibrate. The cardboard cone, with its large surface area, amplifies these vibrations. And voila, you hear music! Since records may be foreign to many students, it may be instructive to allow them to look at record grooves through a magnifying glass or microscope. The recorded information appears as a squiggly line that spirals in from the outer edge of the disk to the center. The nature of the grooves reveals where the recorded sound is the loudest (the squiggle is wide in loud passages) and where the sound has high frequency components (the squiggles are close together). As the needle moves through the grooves, these variations in the groove cause the needle to vibrate, producing sound. Since the needle does not displace much air as it vibrates, it’s necessary to attach the needle to the cardboard to amplify the sound. The “Sound Wagon” is a record playing system mounted in a toy microbus. Inside the electric motor-driven microbus are an amplifier and speaker. A phonograph cartridge is attached to the underside of the bus. 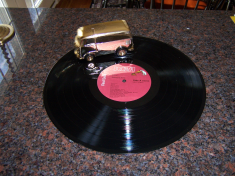 When the microbus is placed on a 331/3 RPM long-playing record, the phonograph needle’s motion through the record’s groove guides the bus from the beginning to the end of each song. Amplified sound from the speaker emerges through holes in the top of the bus. The photo shows the bus in operation. These days, the Sound Wagon is difficult to obtain. A colleague recently purchased the toy on e-Bay. When a conventional phonograph record is made, a metal cutting needle cuts a squiggly groove in the plastic. The wavy groove corresponds, or is analogous, to the sound wave making the needle vibrate. That is why this technology is called analog recording. When a phonograph record is played, the needle, or stylus, vibrates as it passes through the grooves on the record's surface. These vibrations correspond to the original sound that made the cutting needle move. The vibrating playback needle is connected to a small electrical generator (a cartridge) to produce an electrical signal. This signal is then amplified and sent to a loudspeaker. 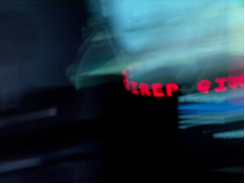 With Talkie Tapes, the recorded information is spread out along a 24" red plastic strip. On one side of the strip is a series of ridges and pits. These high and low points contain information about frequency and loudness of the sound that was used to produce them. During “playback”, your thumbnail takes the place of the needle. The sound is amplified by forcing something with a larger surface area (a cup, paper, balloon, etc.) to vibrate. This vibrating surface, in turn, moves the air molecules that carry the sound to your ears. In this case the cup is used to amplify the sound wave. You can also bite the end of the tape and your head will act as the sound box. Electricity and magnetism are different aspects of electromagnetism, and hence are intrinsically related to each other. Moving electric charges produce magnetic fields and changing magnetic fields produce forces on electric charges. As a result, in principle, any electrical generator can also serve as an electric motor, and vice versa. The motor/generator effect may be dramatically illustrated with two hand-operated generators. After connecting the two generator’s leads together, turning the handle of one of the generators causes the other generator’s handle to turn. Thus one of the identical units serves as a generator, the other as a motor. Many simple motors and generators consist of a coil of wire and a permanent magnet. This is also true of many loudspeakers and microphones. It therefore seems reasonable that a motor or generator might be used as a loudspeaker or microphone. As it turns out, this is case. Items such as the hand operated generators shown above, toys containing electric motors, and hair dryers, all may be used as speakers and microphones. When connected to the amplified output of a radio or MP3 player, a motor or generator can function as a speaker. Alternately, a motor or generator may serve as a microphone when connected to the input of a recording device. Using simple equipment, you can “listen to light”. Many sources of light that appear to be continuous are actually pulsating. These changes in intensity may be translated into sound through the use of a solar cell or photodiode and an amplifier/loudspeaker. Sources that produce interesting sounds include fluorescent and neon lights and novelty LEDs. Since the solar cell is sensitive to infrared radiation, you can even listen to a television remote control device even though you can’t see the radiation emanating from it. Voice and music may also be transmitted over a beam of light. First attach a red LED to the earphone jack of a radio, tape or MP3 player. This may be accomplished by using a cord with a mini-plug on one end and alligators clips at the other. (Note: When using an MP3 player as a signal source, it may be necessary to insert a 10 µF in series in the cord.) The signal from these devices will cause the LED to flicker. The LED will not light if the output of the electronic entertainment device is insufficient. Placing a 9 V battery and a 470ohm resistor as shown in the figure below should remedy the problem. The modulated light from the LED contains information relating to the frequency and intensity of the audio signal. 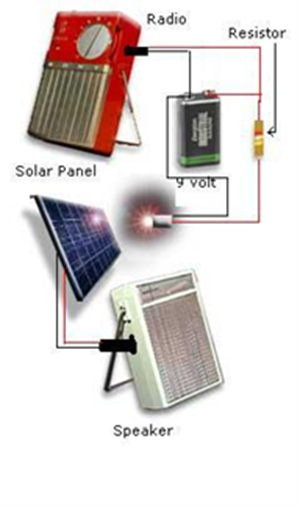 A solar cell or photodiode, connected to an amplifier/loudspeaker, is used to receive the modulated signal. The following figure shows the arrangement of the components in this simple light wave communications system. The quality of the received signal is quite amazing! Students enjoy seeing how far the signal may be transmitted. They should be encouraged to experiment with various optical devices such as lenses and optical fibers in their attempt to extend the range.